Foundation of the company by Master Mechanic Valentin Linhof (1854 – 1929). Start of production and sales of metal circular leaf shutters. Gold Medal for Valentin Linhof’s shutter in Paris. 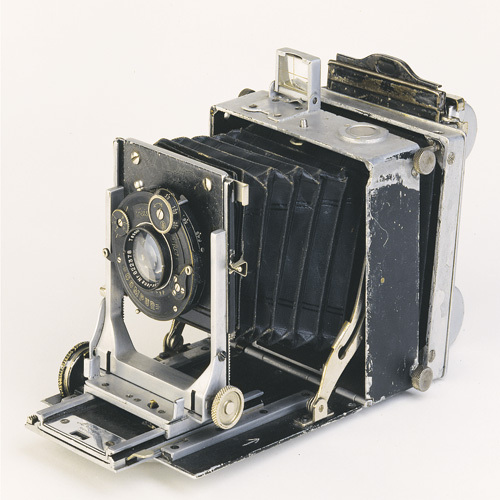 Construction of Valentin Linhof’s first all-metal camera based on the design of – Joseph Barth , a precision engineer from Munich using aluminium instead brass. The format 9 x 12 cm came in two versions: for plates and rollfilm. For the first time the camera was square. By rotating the groundglass screen the format coud be switched from upright to horizontal pictures without removing the camera from the tripod. Patent for Valentin Linhof´s camera shutter being the first incorporated in a lens. Valentin Linhof’s pricelist emphasizes his philosophy/business concept: quality instead of mass production. Nach Valentin Linhof’s Tod übernimmt erst die Tochter Clara Linhof die Firma. 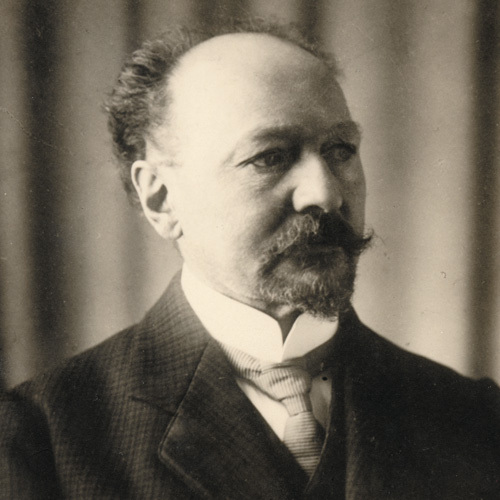 Nikolaus Karpf heiratet die Tochter Claras und tritt 1933 in die Firma einb. Nicolaus Karpf perfektioniert Linhofs Kamera zu der legendären Technika. Der Name wurde aus dem Begriff “Technische Kamera” zusammengezogen. Die Technika-Serie wird in den Versionen 6×9 cm und 9×12 cm gebaut. The Technika III (9 x 12cm / 4 x 5 inch) is a square metal body with swing and tilt frame, triple extension of the drop bed and adjustable standard. The camera was offered with or without coupled range finder system. Technika with coupled range finder system is introduced in the US market, where the Technika is very successful. Followed by the phase of reconstruction the demands on applied photography were steadily increasing. 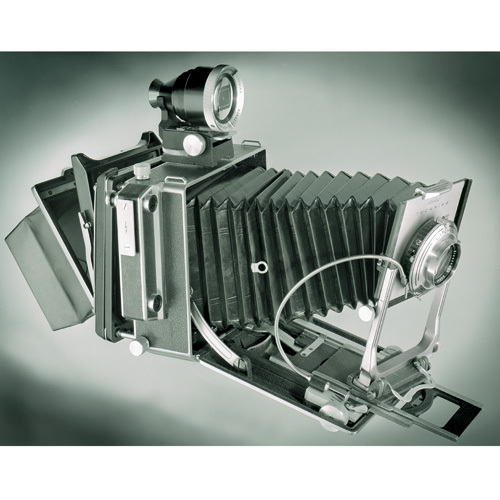 As the logical answer Linhof creates an optical bench camera system, called Kardan: The idea was mounting the camera standards on ball-type universal joints, running along a round base rail for precise picture-taking with perspective control and depth-of-field control. 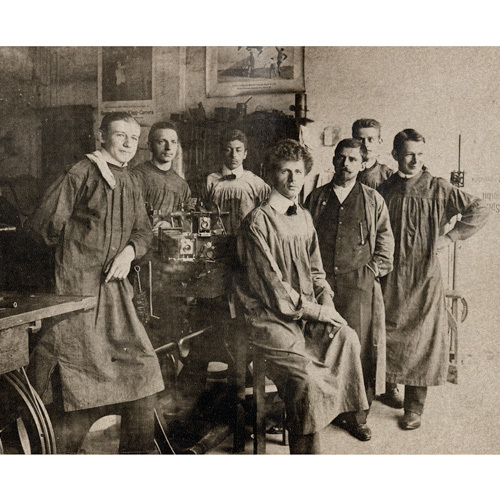 At its peak over 800 employees were working in Munich and other plants. 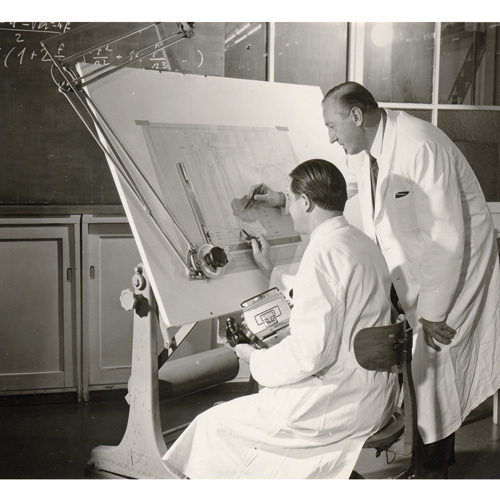 Linhof precision cameras became a worldwide success. 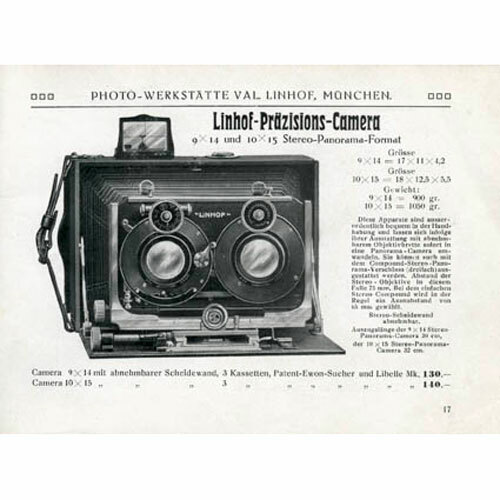 A household name for every pro.Linhof cameras frequently brought back special awards such as Gold Medals at the Paris Exhibition, at the Triennale in Milan and other cities in Europe, the Far East and the USA. New camera systems were developed. The monorail range “Kardan Color” to be followed by the legendary model “Kardan B” with progressive features and a more flexible design suiting less heavy professional tripods made of anodized profile aluminium for outdoor photography. 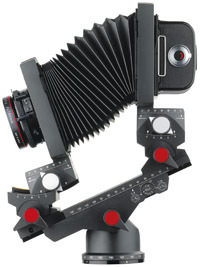 The Aero Technika, a large format aerial camera system was developed: use of 126 mm rollfilm, motorized transport of 150 frames in one cassette with vacuum technique for exact film flatness. Interchangeable lenses from 90 to 250 mm with focusing facilities. The Aero Technika was regularly used in space by American or European missions delivering superb photos. The first Technorama 6×17 is built – rigid rolfilm viewfinder camera for extreme wide-screen (1:3 aspect ratio) shots. Development of the Aerotronica 69 for aerial photography. Long focal lengths for small objects and a new patented rotation shutter system permitting speeds up to 1/1.500 sec for lenses up to 500 mm. 320 frames of format 6 x 9 cm in one motor cassette. 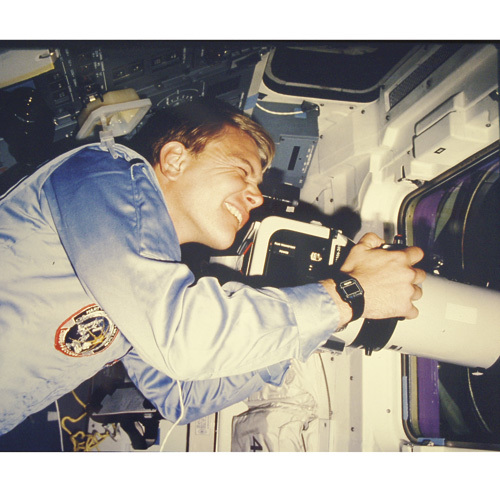 Nasa astronaut Georg Nelson using an Linhof Aero Technika 45 in the 1983 Discovery space shuttle to photograph the earth´s surface from orbit. 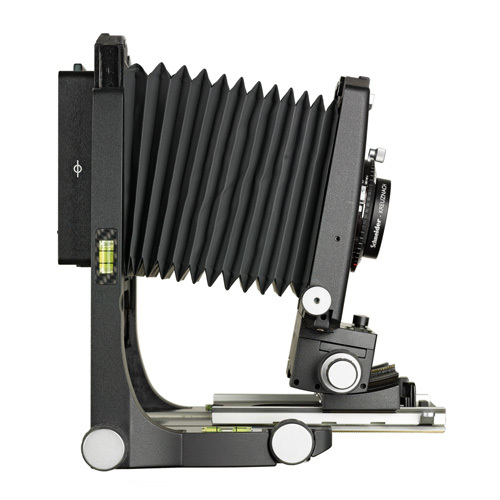 Linhof developed the Technorama 612, als Technorama 612 PC ab 1988 auf dem Markt: Aufnahmen im Format 6×12 auf Rollfilm, mit eingebautem Hochshift für Architekturaufnahmen. Introduction of the Technikardan. A synthesis of the compact Technika and the adjustment facilities of the Kardan monorails. Combining the advantages of both systems the Technikardan became the ideal travelling companion in the formats 6 x 9 and 9 x12 / 4 x 5. In photokina the models Kardan Master GTL and Kardan GT were introduced: extended direct adjustment facilities, base tilt joints with ratchet engagement keep tilted and image standards absolutely parallel to yield yaw-free movements. Telescoping monorail for variable Gegenstandsweite. Both Kardan systems are offered in interconvertible formats from 9 x 12 cm / 4 x 5″ to 13 x 18 cm / 5 x 7″ to 18 x 24 cm / 8 x 10″. GT is the robust basic model, GTL stands for de luxe with additional features. Linhof presents the Technorama 617 S III with interchangeable lenses 72 mm – 90 mm – 180 mm. Panoramic pictures in the extreme format of 6 x 17 cm. Introduction of CAD-system for updated production facilities. Presentation of a completely new camera system for new forms of application in professional studio photography and digital imaging: The Linhof M 679 is a dual system for digital work flow and classic rollfilm photography with a perfect range of adapters and accessories for medium format technique. The photographer is free to select the ideal medium for his job, digital or analogue. Photokina 96 was the date of introducing the new Technorama 617 S III with interchangeable lenses 72 – 90 – 180 mm for the extreme panoramic format 6 x 17 cm. Tipa Award: The Linhof M 679 judged as best professional product. Foundation of Linhof Präzisions-Systemtechnik GmbH. A new chapter of the Linhof history in opto-mechanical and opto-electronical production. Linhof M 679cs with integrated levelling panorama benchholder. Linhof celebrates the 120th anniversary with a special edition of the Master Technika 3000 Jubilee. The Linhof Techno is presented: The system camera for outdoor photography high tech digital. Linhof celebrates the 125th anniversary with a special edition of the Master Technika 3000, Master Technika classic and Technorama 617s III. 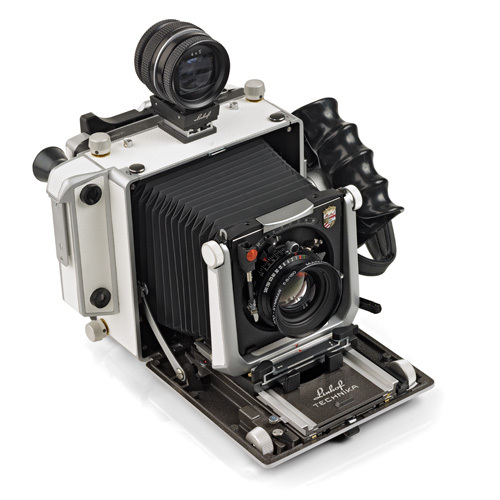 The M 679 and the Techno versatile modular systems are an example of how Linhof represent the future of applied photography and continue to offer the future of imaging – today.